Love it more than my GoPro! For years I've used a GoPro because that's all there was out there. But then I ran across the Tachyon GunCam and decided to give it a whirl. I'm impressed, and I think you will be as well. The GunCam is simple. There isn't a menu with lots of options and confusing numbers about resolutions, burst photos, etc. It's either recording, or off. To record, you push the only button on the camera, it powers on and begins recording. It's that simple. To stop, push the button again and the lights go out. It's lightweight. It doesn't even tip my postage scale past 3oz. GoPro cameras are a little bulky and awkward when wearing them on your head or firearm. 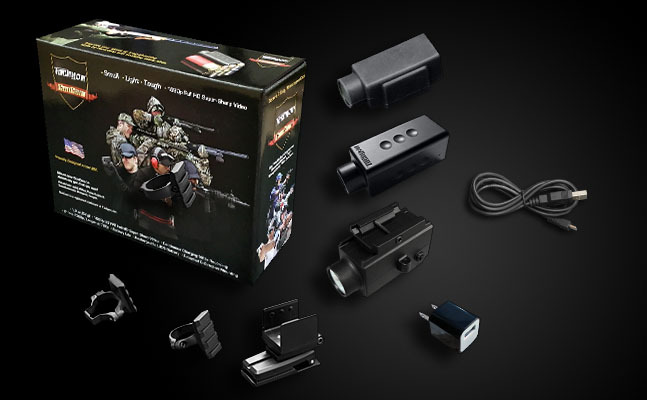 The streamlined GunCam comes with several easy mounting options. The GunCam Bundle comes with every mount imaginable. And the tiny camera simply pops into the mounts at any 90 degree angle secured by 9 plastic dimples. This way you can affix a mount at any angle, then just snap the camera in for recording. For my past local pistol matches I just wore it on my hat via the clip mount and I even forgot it was there several times since it's so lightweight. I plan to use it this hunting season on my .300 Blackout AR rifle and hopefully will come home with some good swine slaying footage. The coolest feature is the BikeCam Mode. Of course keeping the camera running as a dash cam would normally fill the memory card in a matter of hours, my 32GB card holds about 4 hours worth on 1080p. But that's the coolest part of the GunCam in my opinion. The firmware is quick and easy to change and there are several versions available. The "BikerCam" version fills the card in 15 minute video clips and once the card is full it deletes the oldest clip to make room for the new one. So this camera now does double duty for me. Instead of storing it in my office or range bag, it lives on the dash of my vehicle. I just put the switch in "Dash Cam" mode and forget about it and now my last 3-4 hours of travels are recorded in case I need any footage or run into any excitement. I imagine I'll be changing the firmware several times this season depending on what I'm doing. At the moment I have the BikerCam firmware in looping every 15 minutes because I find the DashCam function very cool and useful. But for matches I'm going to prefer the constant record with beeps to make sure I don't accidentally delete any footage and for hunting I'll want the constant record with no beeps or lights to ensure I don't spook any game. Finally, the quality of the footage is excellent. Definitely 1080 HD. The sound is muffled and leaves a little to be desired, but hey, it's designed for video, not audio. It's in MOV format so I use the free GoPro program to capture all the footage you want without filling up your hard drive with gigabytes of unneeded footage. It also captures widescreen angle without a weird Birdseye rounded effect. If you've been looking for a camera to record your travels, shooting and hunts. I think we found a winner. Awesome camera. Very clear picture and good sound quality. I use it for tactical type work. Solid. "The" camera to use if you are a Shooter! Wow! Picture quality exceptional, wide angle video just right. Mounted on my hat, I plan to mount on rifle as well. Contacted the company several times, the response and support was prompt, helpful and informative on different uses. I have a GoPro 4 that I use for Mountain Biking and other things, I have tried to use it for shooting, even on the narrowest setting it's just too wide and big time fish eye effect, bit heavy on the hat and mounts for weapons are nonexistent, my GP4 still has it's use. The Tachyon camera is simple to use, small, and light. I can see some heavy use to come on matches, range, hunting etc. It is also a great learning tool for proper grip, control and rapid fire. I really love this camera for its versatility and great footage. I've made numerous gun camera footage at the range and the footage is excellent. This camera is every bit as good as the Go-Pro and other higher end camera's but at a much cheaper price. Can't say enough good things. This product is awesome. And SO well built! It's taken some hits which should have destroyed it, but it's rock solid and flawless. Ordered the gun cam bundle but Amazon messed up my order. I contacted Tachyon and they made it right. My husband is sure to love the product. If there was any chance of breaking, I would have broke it. Great BUY! First use was goose hunting and it was flawless on picture and quality. Have amazing footage right out of the box. Also it isn't water proof but I put the water proof protection case over it and used it for 4 hours in pouring rain goose hunting and never had an issue. I also use it for training on the range and take down and it works great on tactical equipment too.